Tostadas are my second favorite Mexican food. Next to Tacos of course! 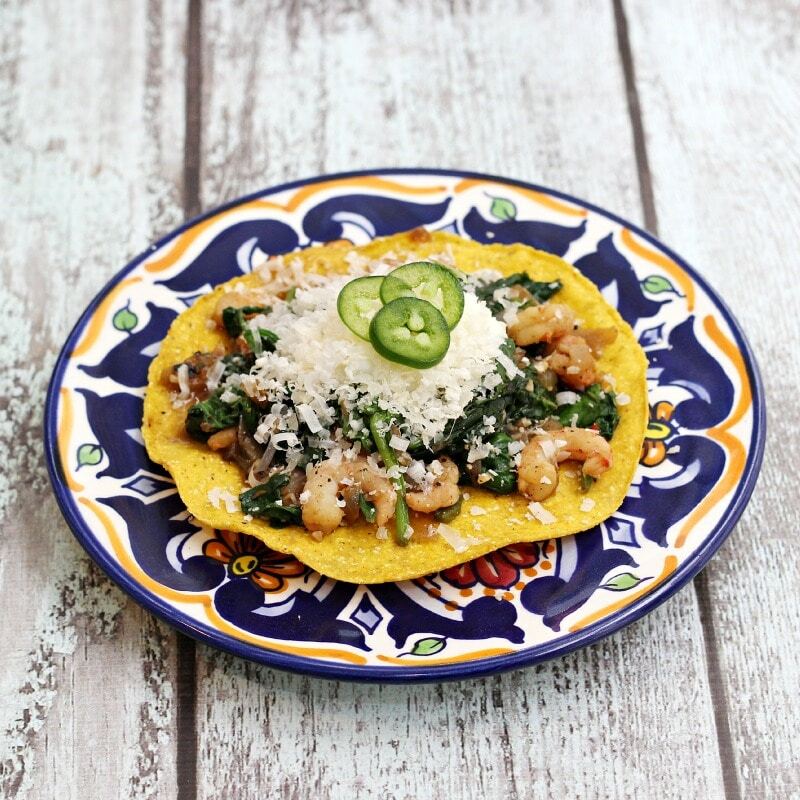 Garlic Shrimp and Spinach Tostadas are filled with flavor, only require one pan and are perfect for lunch or dinner. Not a fan of shrimp? Switch out the shrimp for cubed chicken. 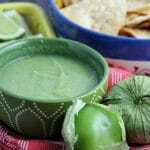 Top with cheese or a hearty portion of our World’s Best Guacamole or Salsa Verde. 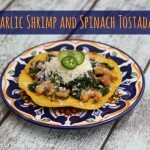 This recipe for Garlic Shrimp and Spinach Tostada was one of the first meals my ex-husband made me when we were dating. He called it a Popeye Tostada, I called it delicious! Loaded with fantastic flavors piled on top of a crunchy tostada. 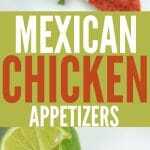 A quick, easy and delicious recipe for a great Mexican meal. Place olive oil in pan and sauté garlic and onion until slightly browned. Add shrimp, cook together for 2-3 minutes on medium heat. Arrange on top of tostadas and serve with salsa, crumbled feta or sliced jalapeños. You can top these tostadas with just about anything. 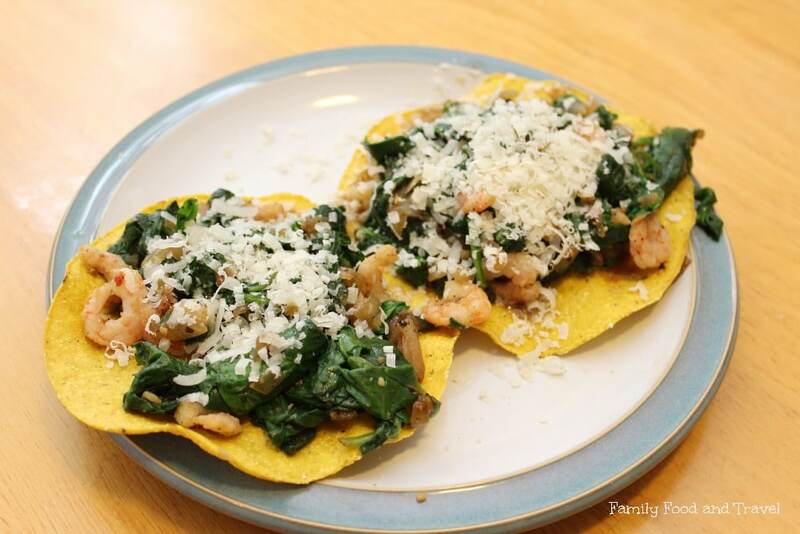 Finely grated cheese, feta, salsa, beans – really anything you would like to combine with the savory garlic shrimp. I love mine with grated old cheddar and some sliced jalapeño – perfect combination of flavors with a bit of spice. What is a tostada? The actual word tostada means “toasted” so it can mean a variety of different things in Latin America. 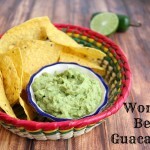 For me, and for these recipes, I am referring to a hard tortilla – my favorite brand are Charras and are available at most grocery stores and WalMart – try the Charras Tostados Jalapeno for a bit of spice. 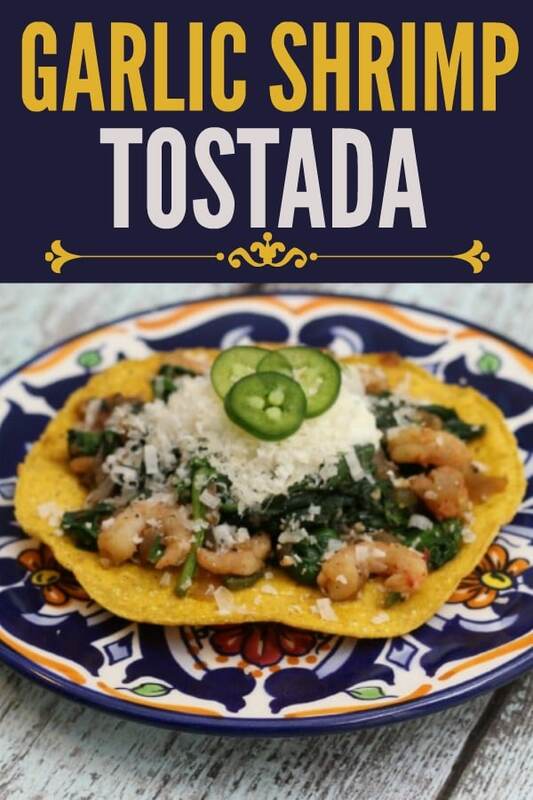 What is your favourite tostada recipe? 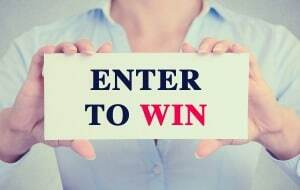 We’d love to know what you top yours with – tell us in the comments. Pin our Tostadas to find the recipe easily. Oh my goodness…your pictures are divine. I am looking at them and I am getting hungry. :) Thanks for the recipe…I will share it with my family. 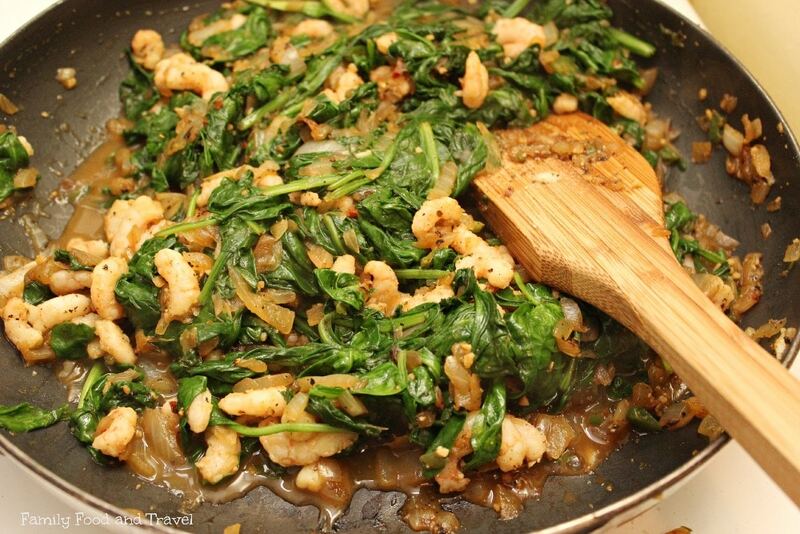 Love spinach and shrimp, never had them together. See, now that’s a NICE looking tostada!! I don’t eat shrimp, but my kids do and would love this. I’d love it sans shrimp, or maybe with even a handful of cashews (don’t judge, I’m nutty, I know) thrown in. I’m pinning this for trying out at some point! What a tasty recipe and such a beautiful presentation. My husband is crazy for garlic, and would love me to make this! Me, on the other hand, enjoy shrimp very much! Jenna Em recently posted..Kinder Surprise Egg 2013 & 2014 Toy Collections! Is YOUR Collection Complete? This looks absolutely yummylicious! I’m a big fan of garlic shrimps, never tried with spinach though. THank you for sharing. This is right up my ally! and with the jalepeno on top.. that seals the deal! Holy Moley does that look super yummy! Thank you for sharing! Yum, I love garlic shrimp. 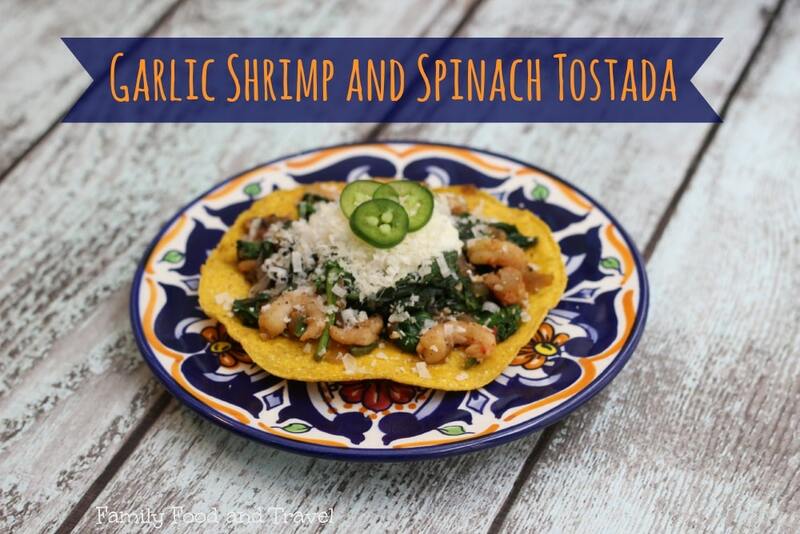 Paired with spinach it makes it a healthy bomb :) Your dish looks so inviting. 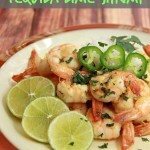 love shrimp – this looks great! Love garlicky shrimp! This recipe sounds delicious!